SkyFile, a global provider of file hosting and sharing services, announces the release and immediate availability of SkyFile 4.2. The enhanced service incorporates innovative, new technology that eliminates a frequent requirement of file sharing services of storing users’ IP addresses. SkyFile, a global provider of file hosting and sharing services, announces the release and immediate availability of SkyFile 4.2. The enhanced service incorporates innovative, new technology that eliminates a frequent requirement of file sharing services of storing users’ IP addresses. “Piracy and misuse of the identity of those remotely storing and sharing files has become an all too frequent problem,” said Alex Kvak, Director of Development of SkyFile. “The benefit to users of this new layer of protection offered in SkyFile 4.2 is that anyone wishing to share a file needs only to share a link to a file when communicating with others. There is no log-in, no email address requirement, and no capture or storage of IP addresses of people storing files or people being offered the link.” All that is required to download a file is click on the provided link. SkyFile provides the same privacy file upload/download protection for both computers and web enabled phones. Files, regardless of format, may be distributed to or from virtually any platform. All data, digital images, audio, videos and personal information resident on the SkyFile host are manageable only by the owner; accessing links provided by the file owner through email, SMS, instant messaging or user selected social media sites are the standard means for downloading. File password protection is optional, and a public/private switch allows file owners to further control access to sensitive information or to prevent distribution prior to a scheduled release. Two gigabyte uploads and a total of 25 GB of file storage are offered without charge or contractual commitment; free accounts allow 90 day retention of inactive files. Those with larger file storage and distribution requirements, unlimited days of inactive file storage, and the need to embed links in documents stored on SkyFile may choose from a variety of paid plans. Paid plans include 100 GB of storage with commitments ranging from one day to one year, and ability to embed SkyFile links in stored documents. “We’re not just another dot com,” said Kvak, “skyfile.co the dot co that respects and protects the privacy of our users.” Signup for a free SkyFile account and/or learn more about SkyFile and its services by visiting http://www.skyfile.co. Skyfile hosting and file sharing services enables users to remotely store up to 25 GB of data and video files without charge and to distribute links that allow access to the stored file. 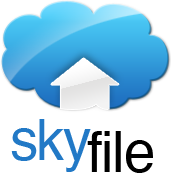 Unlike other file sharing services, SkyFile does not require login, email or IP addresses for anyone downloading a file. Instead, the file recipient needs only to click a link from email, SMS, IM, embedded in a SkyFIle stored file, or a owner-specified social media site. Premium (paid) plans include 100 GB storage and authorization to embed links into files stored on SkyFile servers – a feature not afforded to free accounts. A special one-day plan is available for one dollar. One month plan is eight dollars; a three month plan costs $20; six month plans are available at the discounted rate of $28, and one full year of premium service is available for $50.